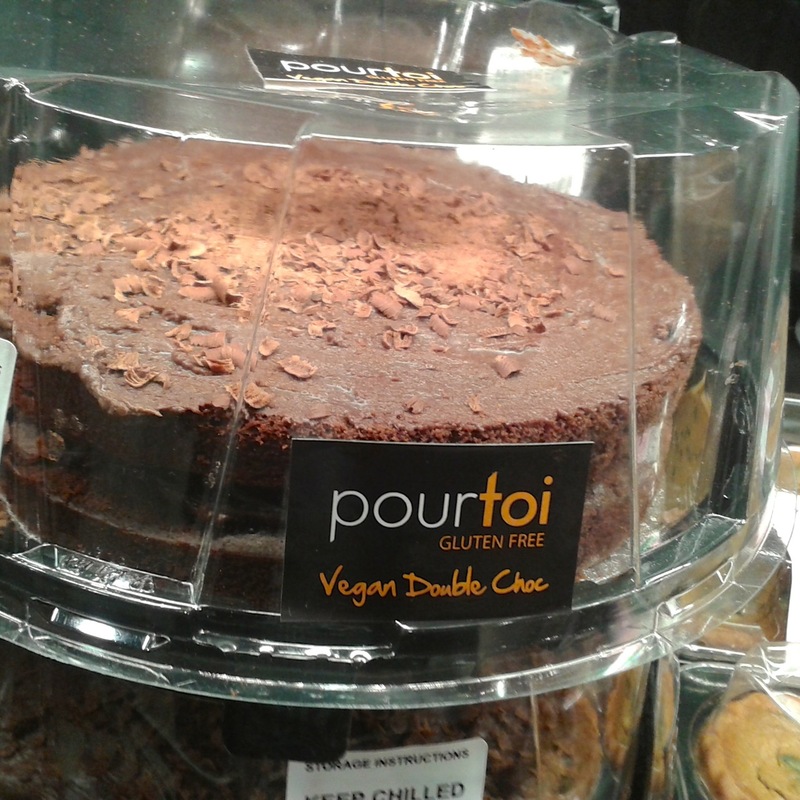 You are in Central London and suddenly you are in desperate need of an entire vegan chocolate cake. What a dilemma! Well, your traumatic cake experiences are finished now that you can buy your very own vegan chocolate cake from selected Whole Foods Market stores around the capital. 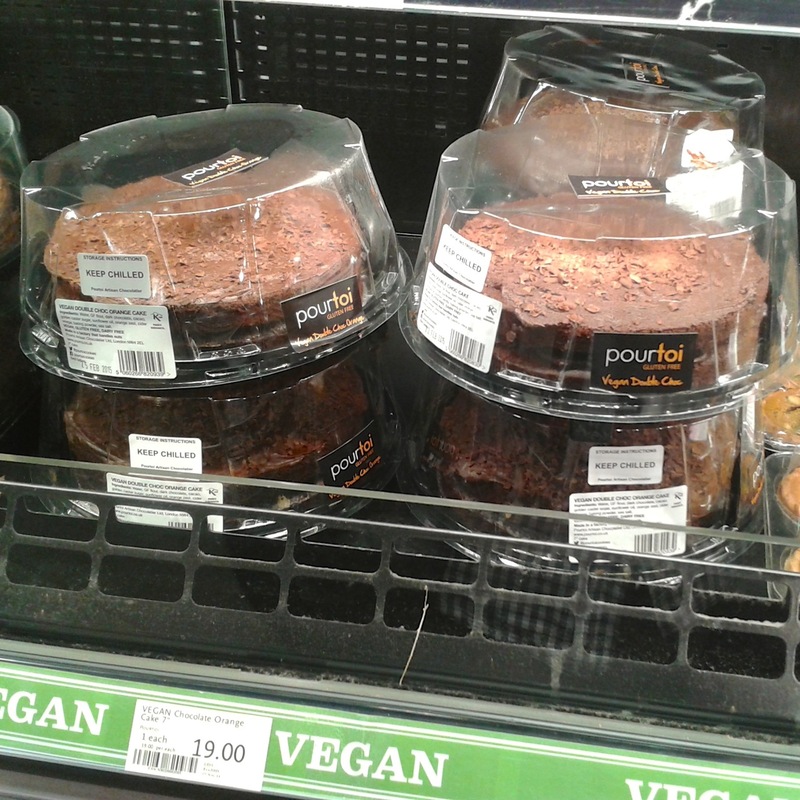 Specialist freefrom bakery Pourtoi have started producing large, double-layer gluten-free and vegan chocolate cakes for the rapidly expanding grocery chain. I spotted both the chocolate and choc orange varieties in the Piccadilly Whole Foods Market a few days ago. Of course a double-sponge vegan cake in an upmarket London supermarket isn’t going to be cheap, so I don’t think I was shocked by the £19 price tag. What do you think? Is £19 an acceptable price for such a specialty item in London? Would you buy one of these for a work function or to take to a party? I bought this cake for a friend’s birthday recently. It was really tasty. Quite rich so we had smaller slices per portion than we might otherwise have, meaning it went a long way. Perhaps a little overpriced but it was cheaper than some of the other quotes I was given by cake companies or the tube ride to Ms Cupcake and back. The thing I couldn’t understand was why they had to make it vegan AND gluten free. Wonder if the gluten free flour makes it more expensive. We charge £12 for a handmade vegan layer cake at Painted Elephant and we can do gluten free. It serves 12. I know things are cheaper up north, but ours are made to order! they used to sell slices of a vegan chocolate cake that looked much better, and if you went in on the right day you could take a whole one away. It was about £24 I think but was bigger than that and was a proper chocolate fudge cake with thick layers of fudge (not buttercream) on the top, middle and side. They did it until about three years or so ago. I’d pay £19 but think they skimped on the covering too much to be honest. I commented on this on fb, but forgot to say don’t forget to take into account the cost of packaging & labelling too! I don’t know about the quality of the cake as I’ve never tried it, but speaking as someone who makes vegan & g-f cakes as part of my business at Loaf vegan b&b (thankfully not the only part, or I’d have no livelihood!) it’s really about the right price. Of course the cost of the ingredients isn’t £19, so yes you could ‘make cheaper at home’, but you have to take into account the fuel costs to cook & deliver, & the time for the person who makes it. People have to earn a living. I did a vegan Afternoon Tea yesterday at a much-reduced rate than normal, as it was for friends of a friend, & worked out I was earning less than minimum wage… So would the maker of this cake be if If you put the price down to the £10 mark. Everybody deserves to earn more than minimum wage right?